I&P publishes a quarterly newsletter highlighting its most important news. An overview of the January 2019 editoin: editorial of Jean-Michel Severino, CEO of Investisseurs & Partenaires, a new partnership between I&P and the Government of Monaco to launch the first impact fund dedicated to education in Africa, an interview with the founder of the clinic PROCREA, Dr. Myriam Kadio Morokro Brou, the last investments of I&P and Teranga Capital and the first exits of the fund IPAE 1. "2018 has been a year of significant achievement. 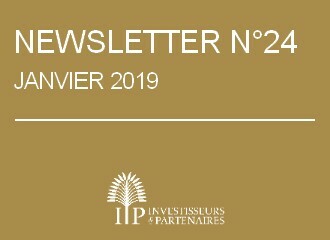 The Investisseurs & Partenaires family has reached several milestones: the first investments of the fund IPAE2, the launch of Miarakap in Madagascar and of Comoé Capital in Côte d'Ivoire, the first exits of the fund IPAE 1, a successful first year for I&P Conseil... A number of new colleagues joined the team, and we had a wonderful time of gathering in Côte d'Ivoire for our first team seminar on the African continent. We live in a complex and uncertain context, for Africa as well as the rest of the world. We are proud to bring a contribution to the challenges facing the African continent in the 21st century: job creation, social justice, climate emergency... We are convinced that the new generation of entrepreneurs we have been supporting for more than fifteen years can provide innovative and effective solutions to these challenges! The coming year will also bring exciting new projects, with the final closing of the IPAE 2 fund, the launch of a new African impact fund sponsored by IPDEV 2, a partnership with the Government of Monaco to create a fund dedicated to education… 2019 will also be a decisive year for the blog Enterprising Africa, launched a few weeks ago in partnership with the Foundation for Studies and Research on International Development (Ferdi) and the African Club of Entrepreneurs. Its objective is to promote entrepreneurial dynamism in Sub-Saharan Africa, by combining first-hand testimonies with academic perspectives on the continent’s major challenges. Let us hope that the values of progress and justice will prevail in the year to come and that African companies will prosper for the benefit of the continent's sustainable and inclusive development!"